This course concentrates on the elements and the language of Arabic Calligraphy through the visual elements (line, volume, texture, color, shape). Moreover, this course also concentrates on the recognition of the different forms, Styles & Types of Arabic Calligraphy. In addition, they well learn the History of Arabic Calligraphy, Materials & Tools of the Calligraphers. •	To introduce the basic elements, principles and techniques of Arabic Calligraphy. •	Developing the perceptional ability of the recognition of Letters and their Forms, Styles & Types. •	Developing Preparing students to deal positively with Letters in Each Style. Saleh Al Shukairi is a member of the Omani Society for Fine Arts, where he is one of the founders and active participant of the Calligraphy Club and the Youth Studio. Saleh has exhibited internationally, notably in Germany, Pakistan, South Korea, Washington DC - USA and the UAE, and the 11th Asian Art Biennale in Bangladesh he received an "Honorary Award". He has participated in all calligraphy workshops in Oman since 1993, the largest painting in the world the Muscat Festival in 2000 and in Sharjah 2009 and in the Folk Festival organized by the Smithsonian Institute in Washington DC, USA, in 2005. 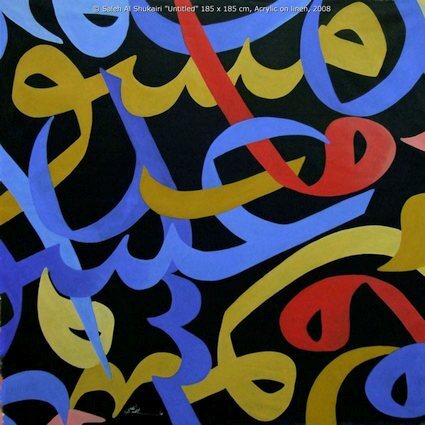 Saleh`s work ranges from time-honored classical religious calligraphy to contemporary abstract work that utilizes this traditional art form. He enjoys experimenting with materials, colors and techniques to produce his evocative pieces. He has produced more than One Hundred Sixty artworks since 90`s.